Winter is the best time to prune most trees and shrubs. It’s cold outside and the ground is covered with snow. This may seem like the perfect time to relax by a roaring fire, but it’s also a great time to perform an important gardening chore: pruning. Why is pruning so important? Pruning can help control the size of a plant, direct growth, influence flowering or fruiting, rejuvenate old, overgrown plants, or maintain plant health and appearance. 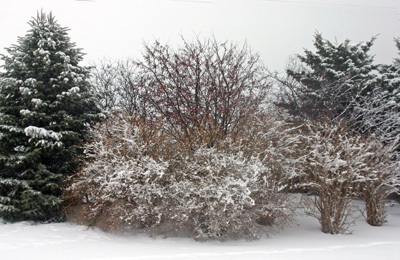 For shrubs, pruning also encourages growth below the pruning cut. For trees, pruning can also help prevent safety problems from broken, diseased, dead, or dying branches. 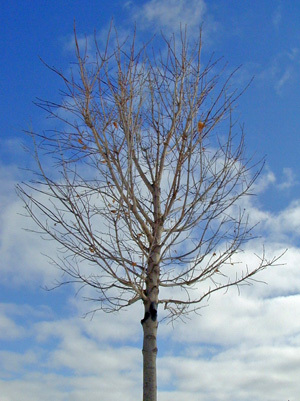 A deciduous trees structure is more apparent when leafless. This is a good time to prune most deciduous trees because at this time of year you can see the overall branch structure easily, and insects and disease-causing organisms are not active. This is especially important for oak trees to help prevent spread of the fungus that causes oak wilt. Elms should not be pruned in summer either as the elm bark beetle is attracted to fresh cut wounds and can transfer Dutch elm disease. But don’t wait too long; in late winter, some trees may bleed or ooze sap excessively in the early spring. Although the bleeding may be unsightly, it is perfectly natural and is a sign that the sap is “flowing” in late winter/early spring before budbreak, but it does not harm the tree. Some trees that bleed excessively are maple, willow, birch, walnut, beech, hornbeam, elm, and yellowwood. Newly planted trees should not be pruned unless a branch is broken, diseased or dead. Young trees (established for 2-5 years) can be pruned to encourage a well-branched canopy, but be careful not to remove more than 1/3 of the total crown at one time. Older trees should not require pruning if properly trained when young, other than to remove damaged branches. If older, large trees need pruning, it is best to hire an International Society of Arboriculture (ISA) Certified Arborist to prune large trees. A list of certified arborists for hire is available at the Wisconsin Arborist Association (WAA) website. Spirea in need of pruning. 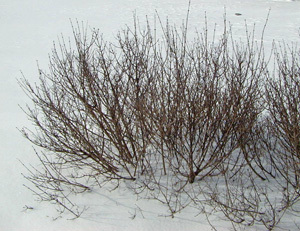 Summer-flowering shrubs should also be pruned when they are dormant or in early spring before budbreak. 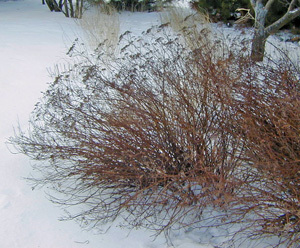 These shrubs produce flower buds on new growth in the spring, so if you postpone pruning until late spring or early summer, you will remove many flower buds. Some summer-flowering shrubs include hydrangeas, roses, Japanese spirea, rose-of-Sharon, potentilla, and smokebush. Spring-flowering shrubs, such as this small lilac, can be pruned in winter or after flowering. Spring-flowering shrubs produce flower buds on one-year-old wood (wood produced the preceding summer), so it is often recommended to wait until they have flowered in spring, but before the next year’s flower buds are set, but it won’t harm the plant if done prior to flowering. For plants that need only moderate pruning, they can wait until after flowering. 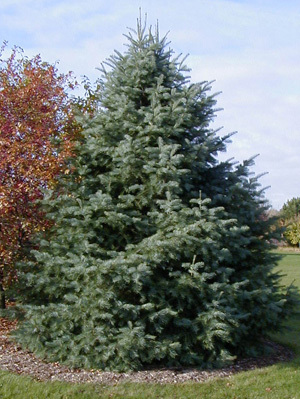 Evergreen trees generally do not need pruning, but if necessary should be done in spring or summer. For those that are very overgrown it is better to prune in late winter/early spring. 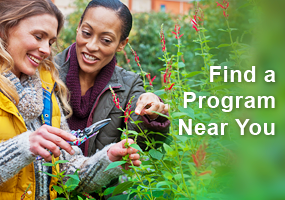 Some flower buds will be removed, but this really is the best time to prune plants. Spring-flowering shrubs include lilacs, forsythia, viburnums, honeysuckle, chokeberry, mockorange, and weigela. Evergreen trees such as pine, spruce, fir, Douglas-fir, and hemlock generally require little pruning, but if necessary this should be done later in the spring or summer. Using the right tools makes pruning easier. 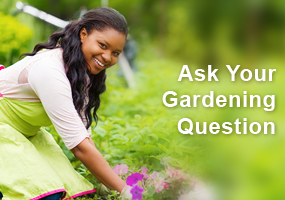 The method you use to prune your plant depends on what type of plant it is and what you wish to achieve. For specific techniques, consult the references listed below. Thinning preserves overall plant shape by selectively removing interior branches, down to the base of shrubs and back to larger branches on trees. This is the most commonly used technique. Heading back reduces the height of a shrub by removing each branch back to a larger branch or bud. Crown reduction accomplishes the same thing in trees, and is much preferred over topping or tipping. Crown raising removes branches from the bottom of a tree to provide clearance below the branches. Rejuvenation restores overgrown or leggy shrubs by cutting the entire plant back to a height of 4 – 10 inches from the ground. Only certain shrubs can tolerate this, such as potentilla and spirea. Shearing removes new shoots to eliminate the shrub’s natural form and create a specific shape for formal hedges. This is only effective on certain plants, such as yews and boxwood. Pinching removes shoot tips to encourage additional side branching to increase bushiness of shrubs. Deadheading removes spent flowers by hand to encourage a second flush of flowers or remove unwanted future seedheads. As with any other task, using the right tools produces superior results (not to mention less frustration). What implements should you be using for pruning? The choice of tool to use depends on the size of the branches and the amount of pruning to be done. 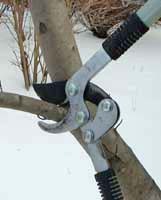 Hand pruners are used to remove branches less than an inch in diameter. Many different kinds are available. To avoid tearing or crushing of tissues it is best to use a by-pass style pruner rather than an anvil-style pruner. By-pass pruners use a curved cutting blade that slides past a broader lower blade, much like a scissors. Lopping shears should be used for branches up to 2½ inches in diameter. They are similar to hand pruners, but have larger cutting surfaces and greater leverage. Clean, sharp implements make pruning easier. inches in diameter, chain saws are preferred, but they should only be used by qualified individuals. All pruning implements should be kept clean and sharp to make pruning more efficient and easier. Interesting article. I’ve just come in from pruning my lilac bush. Maybe I will get some blooms this spring. I saw nothing last year, I’m hoping proper pruning will be the remedy. A great informative article you have shared on this page about the tree pruning in winter season but if you postpone pruning until late spring or early summer, you will remove many flower buds. Some summer-flowering shrubs include hydrangeas, roses, Japanese spirea, rose-of-Sharon, potentilla, and smokebush. Great article. Pruning in the winter is my favorite excuse to get outside and enjoy my yard. Thanks for another great article! Winter pruning is a great excuse to get outdoors and enjoy your garden even though it is cold outside. I always appreciate having made the effort when things start to leaf out and the garden looks like it is cared for and loved. I do need to do some pruning so I was glad to find this article. Not too crazy about pruning in the cold winter but will do it as it seems like it is the best time to do it. I may have to get a pruning saw as some of the branches are bigger in diameter. This was helpful. I have several overgrown spirea bushes that must be cut back. I wasn’t really aware of the different seasonal requirements for the pruning of different plants. This explains what happened to my spring lilacs. I will get out earlier next year. Excellent refresher on the reason for pruning and also great tips on when to prune certain types of trees. 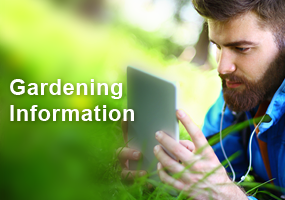 I need to read these articles several times in order to understand the art of pruning. Now that I understand when, I need to review the how to. The type of tool used was very helpful. What a great reminder. I usually prune in early spring and I’m so glad to know that certain pruning is ideal in winter as well. I appreciate this information and consider the extension a definite asset. Thank you for you dedication. This is a really informative article that I’ll be saving. Like many other people, I find that spring and summer fly by and pruning doesn’t get done. Great to know I can do it in winter. Excellent info on the “when and what nots” of pruning. I need to especially adapt to pruning in the winter/early spring, when I have more energy and extra time!